Paul Pogba left Old Trafford on Wednesday night with the stony-faced expression of a man who continues to be less than happy with life at Manchester United. Asked to comment on his bit-part role in a 2-2 draw with Arsenal, the club’s record £89million signing shrugged and said ‘what do you expect me to say?’ before disappearing into the night. Pogba had been benched for the second time in four games along with United’s other most expensive acquisition Romelu Lukaku. It wasn’t as if they were being rested for more important games either. Arsenal are a far tougher proposition than bottom-of-the-table Fulham will be on Saturday, and then United fly to Spain for what could be a largely irrelevant final Champions League group game against Valencia. Jose Mourinho was making a statement by dropping his two biggest names despite already being without Alexis Sanchez, who returned to Chile on Monday for treatment on his hamstring injury. 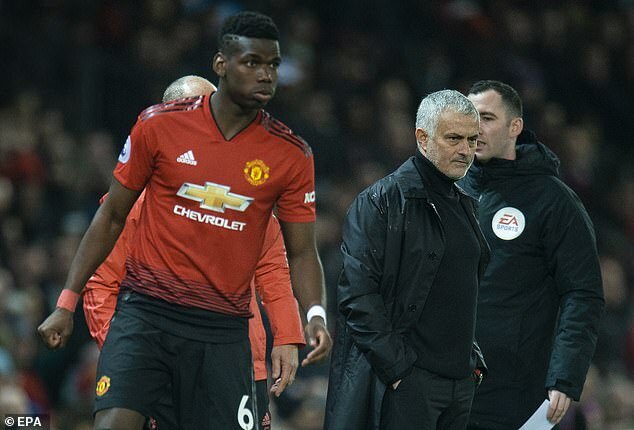 It’s understood that Pogba was uppermost in Mourinho’s mind when he accused some of his players of being afflicted by ‘a virus’ running through the club before Saturday’s draw at Southampton. After another careless performance from the Frenchman, Pogba was immediately informed that he would be dropped for the Arsenal game. Mourinho pointedly wrote in his programme notes: ‘There isn’t space for people that are not ready to give it their all.’ While the manager’s issue with Pogba is one of attitude and application, Lukaku is more a matter of confidence. Prior to his goal at Southampton, the Belgian hadn’t scored in 12 games for his club. With Jesse Lingard, Marcus Rashford and Anthony Martial in attack against Arsenal, and Ander Herrera taking Pogba’s place in midfield, United played with more zest and that was appreciated by fans. ‘We need happiness on the pitch,’ said Mourinho. ‘We need people who give that good feeling, and the three young guys (Rashford, Lingard and Martial), quite light, were alive, agile, creative. The midfield was strong, Herrera pressed so so well and so so hard.’ With so many games coming up over Christmas, Mourinho will need to use his squad. Pogba and Lukaku will be back, possibly as soon as Saturday. But Mourinho is clearly losing patience with his stars, and former United midfielder Paul Ince, for one, believes he is right to get tough with them.